Welcome to the world of Love, Beauty and Freedom. This site is dedicated to introducing you to the Teachings of Guruji Sri Vast – a Master, Mystic and Poet – teaching the celebration of life as a way to total liberation. It is an invitation to rediscover oneself and the cosmic life on this planet. The graceful presence of the Living Master is an inspiration to celebrate the life and explore the highest potential of human existence. Oh come, let us Rejoice! Oh come, let us immerse in divine grace! 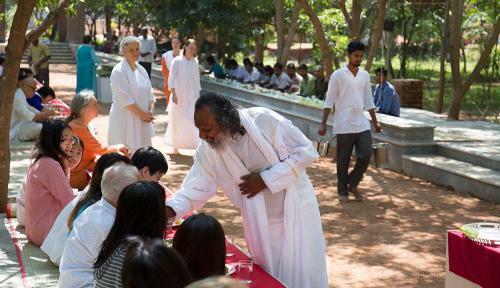 An inspirational retreat in the presence of Guruji Sri Vast, encouraging one to go beyond one’s limitations and awaken the connection with one’s true Self – evoking the inner child to dance with the Life! From a profound experience of Total Liberation, Guruji Sri Vast shares with us, in a practical way, the Art of Enlightenment, and how it is accessible to everyone through a process of inner transformation. Truth, Godliness and Beauty. The retreat is an eye opener to discover one’s purpose of this life and realize one’s highest spiritual potential. The Mystic’s Way retreat starts with the celestial occurrence of the winter solstice. This period of the year is known to be auspicious for spiritual evolution, divine celebrations and liberation from the past. It is a beautiful time of the year to nurture oneself in the graceful presence of the enlightened Master. Do I escape this moment?